Evidently I am the only supply of neckwear wearing at the new job. My casual Friday experience was what I thought it would be -- nothing special. Except that I was continually asked where my tie was. Several people nearly demanded that I continue to conglomerate. They did not actually say "conglomerate", of course, but that's how I heard it. Today's conglomeration is all new. I actually started with the shirt this time, sort of. When I picked up the suit earlier in the week I had this purple (They call it lavendar) in mind but I didn't have a tie that I thought would work. I found a similarly colored shirt and the salesman showed me this tie. It has a light gold background with darker gold squiggly lines. What's difficult to make out in the picture are the dots that are different shades of purple. It's a regular Jos A Bank brand. The suit is a new Jos A Bank Signature. It's a medium gray solid. I had been looking for just such a suit for quite some time so when it went on sale at 50% off, I couldn't resist. Then when it was totalled up at the register, it turned out that it was really about one third the original price. SoI bought another blue suit that should make its debut tomorrow. After looking at the picture, I'm really going to have to figure out a better way to take the pictures. The flash washes out a lot of the color and textures of the dress shirts. Sometimes the ties too. 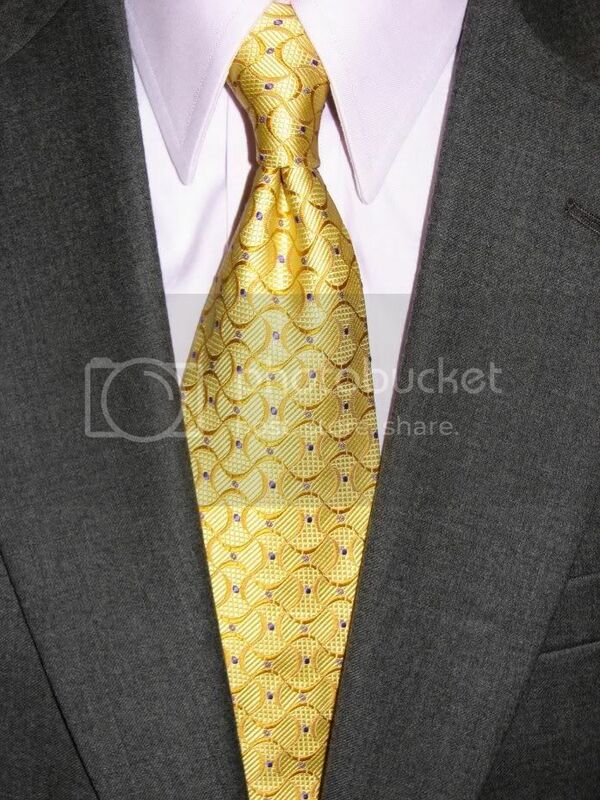 This tie is one of the better looking ties. The pattern, colors, and texture, definitely a power tie. Only thing I would have changed is the dress shirt. I would have worn a baby blue with light sheen material. Other than that awesome look.